The image above, as some of you may remember from your school days, is what is called the fire triangle. It is used as part of most school’s fire safety teachings. It shows the 3 elements that are required to start a fire. 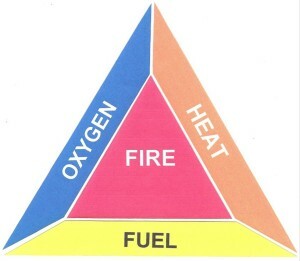 Those 3 elements making up the sides of the triangle being oxygen, heat and fuel. If one of these 3 elements is missing, the fire cannot be started or it goes out. All of my programs are based around my fat loss fire triangle. Focusing on just 3 very important elements allows me to really set my client’s fat loss on fire. Each side of the triangle is very simple but they should all be in place if you really want to ignite your weight loss progress. Not the prettiest of drawings, obviously I’m somewhat lacking in the graphic design skill set, but it gets the message across. I use 3 main elements as a part of all of my coaching and training weight loss programs. 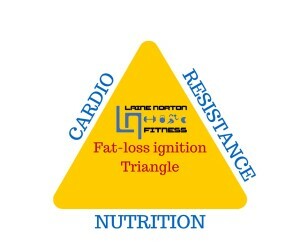 As you can see from the triangle, the 3 elements that play a part in my programs are cardio training, resistance training and nutrition coaching. If all 3 of these are incorporated in the correct ways, your weight loss will rocket. There are 5 words that are vital in that last sentence: “incorporated in the correct ways”. There are so many different approaches to each of those 3 elements that it can seem quite overwhelming. Therefore, I am going to quickly touch on each element and give you an idea of how I approach each one. This approach has changed over time and I expect it will continue to change but at the moment, it is working and yielding great results. I’m going to spare as much time as I can on each of these elements so i will just get straight to the point on each. For cardio training, I use an interval training approach. This means that I incorporate relatively short periods of hard, high intensity work broken up periods of rest or decreased intensity. A very simple example of this would be Hill sprints – you would run up the hill as fast as possible for around 20 seconds, then your recovery period could be a walk back down before you repeat the process for a few rounds. This approach is extremely time efficient and less tedious for most people than the more standard cardio method of just going for a jog. Most interval cardio sessions would last at most 15 minutes and yield a great calorie burn effect for such a short period of work. Many people forget about or even dismiss resistance training as a tool for weight loss. This is a shame because resistance training comes with a whole range of benefits. Health benefits include increased bone density, decreased risk of type 2 diabetes and there are even studies that show a decreased risk for certain cancers. Aside from those awesome health benefits, resistance training also goes a long way to helping with fat loss. One way in which it helps is by increasing lean muscle in your body. don’t worry ladies, you won’t get bulky. An increase in lean muscle actually helps your body burn more calories throughout the day, around 50 extra calories for each pound of muscle you have. So, if you were to burn 10 pounds of fat and increase you lean muscle by 10 pounds, you would have less fat, look more toned and burn an extra 500 calories throughout the day. win-win-win. The approach to resistance training I use and you should also use is to focus mainly on what are called “compound movement or exercises”. These are exercise that require movement from multiple joints at the same time. Moving multiple joints means you are also working multiple muscle, which leads to greater overall strength gain and calorie burn. Your resistance routines should be based around some form of the following: Squatting exercises, lifting from the floor/bending exercises, pushing, pulling, twisting and lunging exercises. For more on the benefits of resistance training visit this post I made. It is aimed at women but the benefits are universal really. Finally, we come to what is perhaps the most confusing of the 3 elements. It seems to be the one which most struggle with, and I am not surprised since there are so many different diets, opinions and methods around. It can be extremely hard to find something that works and is sustainable. Work out how many calories you need to eat to lose 1-2 pounds on average each week (the 1-2 pounds is a safe and sustainable loss). Split those calories into the appropriate ratios of carbohydrates, protein and fats. Use a calorie tracking app to keep a close eye on your intake. Fill at least 80% of your daily diet with natural, unprocessed foods. Do not ban any foods completely, use that remaining 20% if you have a particular craving. Adjust your calorie goals and ratios according to progress. That gives you a bit of an outline of what I do to get results for people. I hope you can take some of it away and add it into your own routines and really ignite your own fat loss. ⟵How Many Calories Should You Eat? A step-by-step guide.